When the Cavaliers were on the verge of the greatest comeback ever, fans from Cleveland and Akron reflected on the significance of the moment. Residents of Ohio shared their thoughts on the NBA Finals and what a championship would mean to the Cleveland faithful. fter back-to-back victories to force Game 7 of the NBA Finals, the Cleveland Cavaliers were on the verge of accomplishing the unthinkable: rallying from a 3-1 series deficit against back-to-back MVP Stephen Curry and the Golden State Warriors, the best regular-season team in NBA history. Cleveland sports fans have waited and waited for this moment - a gut-wrenching 52 years since their city's last professional championship - and before LeBron James & Co. delivered on his promise to bring a title to The Land, those trophy-hungry residents of Ohio shared their thoughts on the Finals and what a championship would mean to the Cleveland faithful. Former Harlem Globetrotter Greg Bell has been in the nonprofit and recreation field for more than 25 years. Basketball is his life. A huge Cavs fan, he attends a watch party at a local barber shop in Cleveland Heights. Jeff Hall is a cook at Happy Dog in Cleveland, a west-side bar known for its toppings, tater tots and trivia. Hall said that being a Cleveland fan all these years has been heartbreaking, adding, "This is our year. Bringing home the championship will be a big turnaround for sports here in Northeast Ohio." 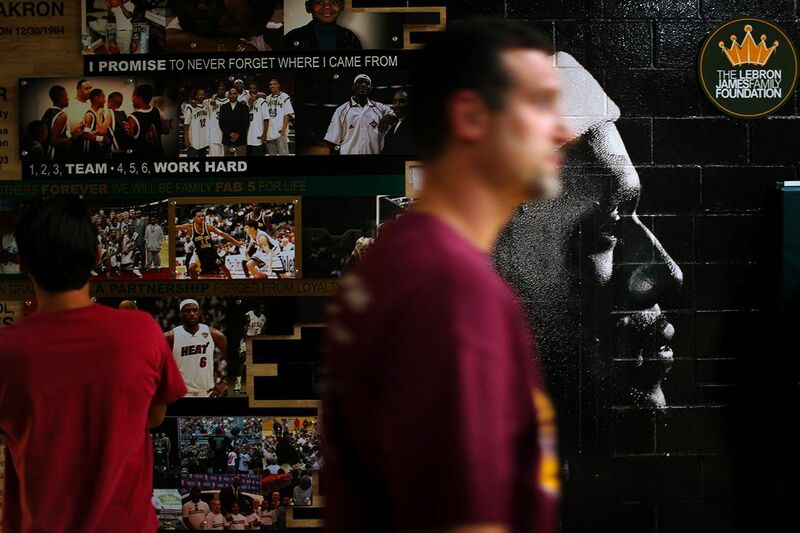 Mortgage broker Ben Blair was born in the same hospital as LeBron James. Blair says it's been rough being a Cleveland fan, but admits, "There's something different about this year -- I feel it! We are going to win this time and bring home the championship. It's Ohio against the world." The message on this Cav fan's T-shirt is directed at the obstacles standing in the way of Cleveland sports history: Steph Curry and the Golden State Warriors. Andre White cuts his son Andre Jr.'s hair at Todays Cut & Style Barber Shop in Cleveland Heights. About his sports teams, Andre Sr. says, "It's always Cleveland -- whatever it is, I don't care. It could be a kickball team. As long as it says Cleveland, I'm all-in." Restaurateur and chef Jonathon Sawyer is a Cleveland fixture. His restaurants -- Greenhouse Tavern, Noodlecat and Trentina -- are go-to spots in town. On being a Clevelander, Sawyer says, "It's tough in general, and that's what has built the attitude we embrace -- 'us against the world.'" On Game 7, Sawyer says, "You literally couldn't figure out a way to have it more stacked against us, which to me seems an appropriate way to bury the hatchet. I think the one thing I'm enjoying about the Finals is that LeBron and the Cavs and their honesty and sincerity [have] shown through more than Golden State's." Absolute Tattoo Co. artist and musician Thomas Kincaid says he is just carrying on his father's tradition of being a Cleveland sports fan. He grew up watching and going to games with his dad, so it's in his blood. He says it's sometimes difficult being a Cleveland fan, but he always supports its teams. If the Cavs bring the championship home, Kincaid says it would be "a weight lifted off all of our shoulders." He says he also gave LeBron James one of his first tattoos. Barber Steve Garritano was born and raised in Akron. He even went to the same high school as LeBron James and watched him play as a kid. He's been a Cleveland fan all of his life. It's had its ups and downs, but he's never abandoned his teams. He says if the Cavaliers bring home a championship, there'll be a lot of tears, especially from LeBron, because Garritano thinks this one would mean more to him than the two he won in Miami. Pete Mitchell, pictured, and his brother Mike started Mitchell's Ice Cream in 1999 with the opening of their first shop in Westlake, a suburb of Cleveland. "As Clevelanders, we've had to be very patient for a hometown championship. A win tonight would mean so much to Cavs fans and the city -- our town will go wild. We've really had a lot of fun rooting for the Cavs the past two years -- we have served 'LeBrownie' and the 'DellaVanilla' shakes and the 'All In Sundae.' We can't keep the wine and gold sprinkles in stock." Rick Wisenberger works as a community outreach laborer. He's a Cavaliers fan through and through: "They get you low and bring you back to the high -- there's no stopping them in Game 7." Robert Freeman works at Alcoa Inc. in Akron, a company known for its work in lightweight metals. Freeman has seen Red Right 88, The Catch, The Drive, The Shot and The Fumble, and he saw the Cavaliers lose last year to the Warriors. He had season tickets to LeBron James' senior year at St. Vincent-St Mary, and he knows how badly LeBron wants to bring a championship back to his hometown. "It would mean the world to Cleveland fans. We are always all-in no matter what! Win or lose, they are our teams and we always support them. This is our year -- I can feel it." Mark Kilian attended St Vincent-St Mary before LeBron James but has always been a Cleveland fan. He was in town visiting his father and had to come to the watch party at his alma mater. Courtney Conley, right, was a cheerleader at St. Vincent-St Mary and remembers LeBron James from the first day they met. She recalls going home to her family and saying she met this guy named LeBron and that he's pretty good at basketball. She has followed his career since moving back to Ohio after college. She says LeBron has done a lot for the community in Akron, from sending kids to college to giving away bicycles. Willie McGee, LeBron James' former teammate at St Vincent-St Mary, takes in Game 7 of the Finals at the LeBron James Arena in Akron. McGee is now the athletic director at the school. St Vincent-St Mary students watch in the gymnasium as the Cavaliers make history and complete the comeback from a 3-1 series deficit against the Warriors in Game 7 on Sunday night. Lifelong Akron resident and Cleveland fan Michael Lillie breaks down and hugs his son Stewart after the Cavaliers' historic title run is complete. Born and raised in Akron, Lillie just wanted to see one of his teams bring home a championship, saying, "I can't believe this happened! I can't believe this happened."